It may be premature to declare that before-and-after comparison videos are all the rage, but hot on the heels of yesterday's Project CARS trailer comes something similar for the upcoming Metro Redux . 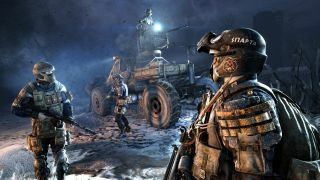 Major visual updates to both Metro 2033 and Metro: Last Light are at the top of the menu, but there's a lot more to it than just a new coat of paint. The video initially focuses on visual improvements to the console versions of the games, which will now be able to provide the same level of visual fidelity as a high-spec PC on the originals. Contemporary high-end PCs will still have the advantage in Redux, however, through support for 4K resolution and a wide array of graphical enhancements. But the really interesting stuff is happening under the hood. The AI is improved, and features that were previously exclusive to Last Light, including better stealth gameplay, weapon customization and non-lethal takedowns, will also appear in 2033. New secrets, hidden areas and encounters have been added, and previously separate locations have been "seamlessly stitched together." Two new play modes have been added, Spartan and Survival, and Ranger mode is now available in both games. I was a pretty big fan of the Metro games when they were new, so I was sold on the Redux release pretty much from the moment I heard about it; if it's possible, I think I'm ever more sold now. Metro Redux launches on August 26.